So since I have consumption and all, this weekend seemed like a good opportunity to revisit this Raspberry Banana Chia Smoothie recipe. I started working on it about a month and a half ago. You’d think a smoothie recipe would be pretty straight-forward, but for some reason it took me a lot of tries to get this one right. Seeing as my tonsils are about the size of golf balls right now, I wanted it to be a little bit thinner than I usually make my smoothies, so I decided to add fewer raspberries this time around. I think that was the key to finally (FINALLY!) nailing this recipe–fewer raspberries meant the smoothie wasn’t so tart. In fact, I didn’t even add any sweetener to mine, although you may want to taste yours and add a little if needed. 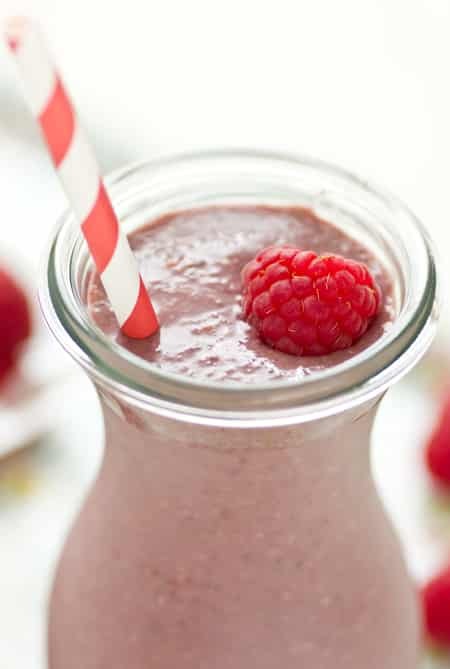 This Raspberry Banana Chia Smoothie makes a great breakfast on-the-go or afternoon snack. Combine milk and chia seeds in blender. Let sit 5 minutes. Add raspberries and banana half; blend until smooth. Taste and add sweetener if desired. I wanted to make this smoothie on the thin side, but if you want yours thicker, try using 3/4 cup milk instead. I’m sorry about your throat! Feel better! I have been wanting to try chia seeds in my smoothies for a while now. Does it really make you feel fuller? Do they have a taste? They don’t have a taste, at least not when combined with other ingredients in a smoothie. 🙂 And I do think they help me feel full. They’re great added to juice too! This may be what the last few raspberries I have become tomorrow morning! YUM! This looks awesome!! If you ever made a photography book, I would buy it because I am obsessed with your pictures. I have yet to try chia seeds. I need to, don’t I? Also, I LOVE the bottle/glass that smoothie is in. Ugh, covet! Also, no more getting sick! You’ve had enough! I decree it so. I just can’t get past the ch-ch-ch-chia song whenever I see a recipe calling for chia seeds. Are these seeds something you can find in a regular supermarket and if so, where am I most likely to find it – which aisle do you think? Looks and sounds wonderful! We love berry smoothies. Your recipe says vanilla or chocolate flavoured milk but then you say to combine coconut milk with seeds. Which? Sorry about that! I used vanilla coconut milk the last time I tested this so I was still thinking about that when I was writing up the recipe. I corrected it–you can use any vanilla or chocolate non-dairy milk. I would love to make this. It looks awesome. This sounds so good and refreshing and filling! Raspberries are my fave! that smoothie looks and sounds so delicious! Oh man, sorry to hear you’re feeling lousy! I make green smoothies to pack to school in the mornings and always throw in a tbsp of chia seeds. I love how they thicken it up, and they’re so full of omega-3’s. I’ve been using frozen strawberries and banana, but raspberries would be a nice switch up. Hope you’re feeling beter soon! Could it be SPRING? I have been feeling tired….a Vc packed smoothie would definitely do me good! It’s starting to feel like spring here–I am so excited! This winter has been a long one. Yum, what a great looking smoothie! It’s funny how a smoothie recipe can take so long to make – I usually just throw stuff in a blender but any time I’ve tried to actually write down what I do to get exact measurements, I can’t seem to get it right! Love the idea of using chocolate milk in this! I hope you’re feeling better! Great smoothie! This is the second recipe I’ve seen with chia and chocolate so now I’m dying to try it. 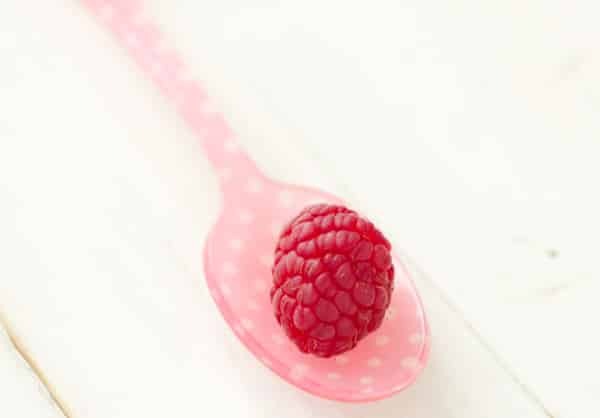 The raspberries are a nice touch and yes, I’ve experienced the same thing – too many raspberries can make a sweet treat quite tart. Great smoothie! Yeah, I love loading my smoothies with fruit so I kept wanting to add lots of raspberries, but nope, it just wasn’t working. I haven’t got a clue what chia seeds are but that’s a tasty looking smoothie. I hope you feel better. My daughter is miserable every time her tonsils swell up, which is oddly often. Thanks, Cat. I can’t even remember the last time I was this sick. :/ Oh well, lots of smoothies for me! That looks really good and refreshing. Gorgeous smoothie, girl! I can’t wait to get my hands on some fresh raspberries. Wow now this is my kind of drink! !